Japan has experienced a record breaking flood event, due to an estimated 70 inches of typhoon rainfall as the impacts of Typhoon Prapiroon and Super Typhoon Maria combined with a lingering rainy front over the last two weeks. The torrential rainfall caused landslides as well as severe flooding, crippling transportation networks, water supply and electricity in the western region. The hardest-hit prefectures are Hiroshima, Okayama and Ehime. Parts of the region saw as much as four times the average July rainfall, with many locations recording their heaviest rainfall on record for 24-hour, 48-hour and 72-hour periods, according to the Meteorological Agency. Our data partner, MetCon, provide 3-day and 5-day flood potential forecasts worldwide. The image shows their 5-day forecast for Japan, issued on July 4, 2018, which clearly predicts the potential flood event impact on locations in the western prefectures. This type of flood forecast data allows risk managers, brokers and insurers to effectively manage their exposures by facilitating the development of effective event response plans. The flood forecast data feeds into automated real-time EigenAlerts with customized thresholds, resulting in targeted information sent when you need it. Thresholds can be set using a variety of metrics, including number of assets, impacted values, ground up loss, and damage factors. The result is smart Alerts that assess the impact for you, and let you know when it is time to act. 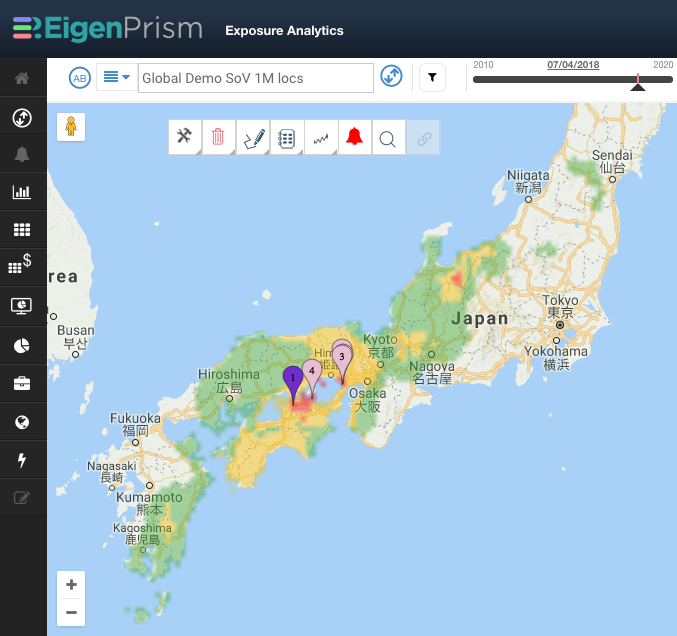 The MetCon flood forecasts can also be accessed in EigenPrism’s exposure analytics platform; and can be used to set smart underwriting moratoriums.